* No. 261 turns a wheel under steam for the first time since 1954. * The crew carefully monitors progress as the 4-8-4 travels from Minneapolis to Fond du Lac, Wisconsin over the Wisconsin Central on her break-in run. * The pride of the Milwaukee Road once again storms a main line with revenue passenger trains � excursions over the scenic Wisconsin Central from Fond du Lac to Stevens Point and Junction City. HERE'S all the action and excitement from the rebirth of one of the finest locomotives of one of America's legendary railroads - the old Chicago. Milwaukee, St.Paul & Pacific. No. 261 was one of ten (260-269) S-3 class 4-8-4 Northern types built by American Locomotive Company (Alco) in 1944 to meet the burgeoning freight and passenger demands of World War II. The locomotives substituted for diesels and streamlined Hudsons on the famous Hiawathas and were regularly found pulling such trains as the Arrow and Columbian. They also performed in freight service until retirement. Two were preserved: No. 261 found a home at the National Railroad Museum in Green Bay, Wisconsin; and No. 265 resides at the Illinois Railway Museum at Union, Illinois. 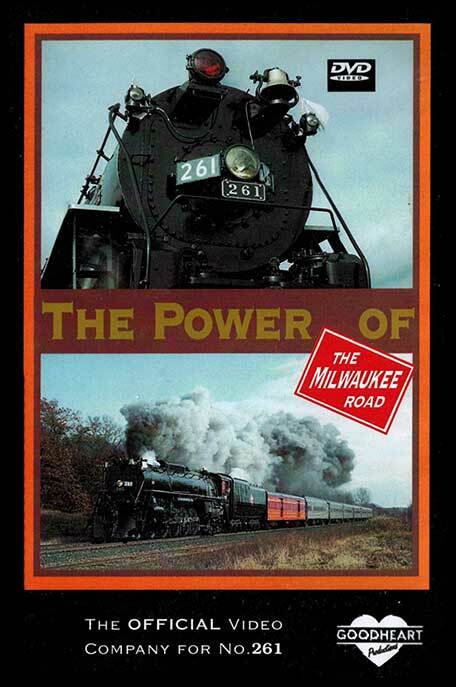 261 THE POWER OF THE MILWAUKEE ROAD provides exclusive highlights of the rebuilding process and takes the viewer along on break-in, fan trip and deadhead runs. Here's every run of 1993, dramatically recorded by trackside, aerial, cab and locomotive cameras. * Street running through the heart of historic Oshkosh, prearranged smoke and sound on Custer grade and passage across the towering St. Croix River Bridge. * Operations in 1993 conclude as No. 261 dead-/'. heads a matched passenger consist from Chippewa Falls, Wisconsin to Minneapolis. Some of the covers used from this producer may not properly fit the DVD cases. Steamboy (Revere MA US) on 2018-02-01 17:51:43. This now 25 year old videotape features the test runs of the midwestern northern itself as it eventually took place where the 2 hour rebuilding was made. The first 10 minutes of this however features short scenes of the engine�s restoration, as Marc Boon narrates the history of the Milwaukee road, as well as the 261 itself. Like 4449 in February of 1989 only goodheart productions and pentrex were there for the test runs of the s3 northern. However the time limit was shorter on the goodheart coverage at 56 minutes, while pentrex�s coverage was only 80 minutes. If you love steam in the 90s, this is the video just for you! DVD Value: Seemed a little high, but not too bad.